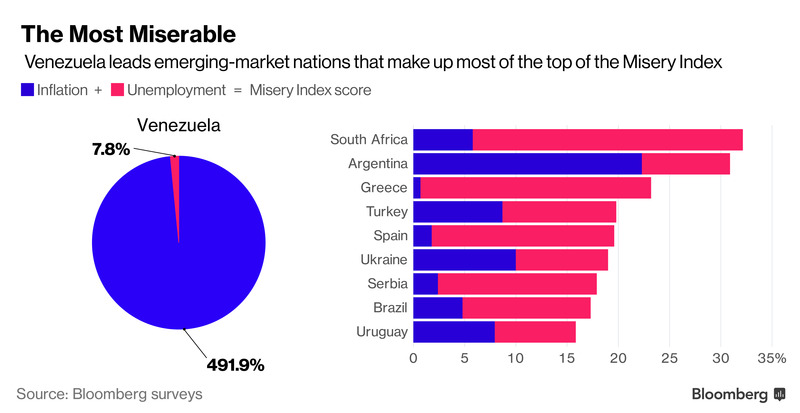 Greece comes in fourth place on the Bloomberg’s misery index, followed by Turkey and Spain. The “misery” calculations are based on inflation and unemployment perspectives. Venezuela tops the list for the third year in a row where both financial and political problems are forcing the country into worse conditions than ever. In contrast, the country with the lowest index is Thailand, but this is mainly due to the way authorities there calculate the unemployment rate, notes the report. Venezuela accumulates nearly 500 points in this peculiar ranking system finding itself in first place. Africa comes in second place with 32.2 points, in third comes Argentina with 30.9 and in fourth — and first of the European countries — is Greece with 23.2. Greece scored even “higher” in the misery rating system in relation to last year’s performance which accumulated a total of 22.7 points, although it remained stable in the fourth. The Ukraine ranked 7th this year, making an improvement after placing 3rd last year, while Greece was followed by Turkey (19.8 points) and Spain (19.6). Completing the “misery” top 10 list are: Serbia, Brazil and Uruguay.